On an average Saturday afternoon, high school students in Korea are out relaxing with friends or cramming for their next exam. 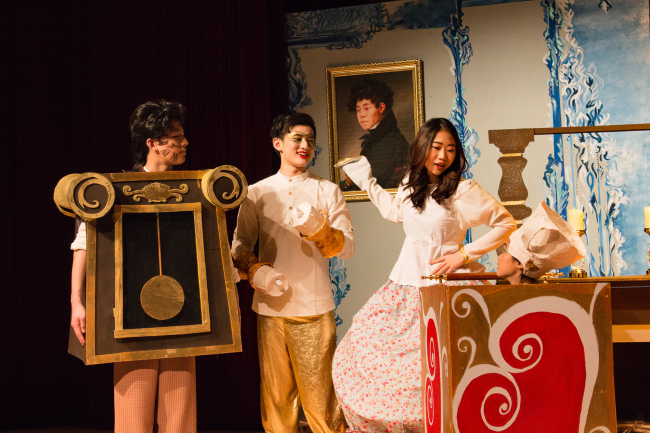 But the 96 students in the cast and crew of Korea International School’s upcoming production of Disney’s “Beauty and the Beast” are spending all day at school rehearsing, painting and making last-minute fixes for their performance. Lauren Cuellar, the high school theater teacher and the director of this show, chose “Beauty and the Beast” to be the school’s biannual musical for its timeless music and variety of characters. Disney only allows one production of Beauty and the Beast per region, and obtaining the rights to the script from January until showtime costs close to $3,000. The theater department at KIS has steadily grown over the past few years into the powerhouse of creativity it is today. Student thespians have developed their passion under Cuellar’s direction, consistently showing strong representation in dramatic speech competitions and student theater festivals. The group has striven to transcend themselves each year by taking on new challenges, whether it be producing original scripts or performing an emotionally heavy plot. They are now highly regarded as a drama department amongst international schools in Korea. “It has been my goal since my arrival at KIS to inspire students in understanding the importance of empathy, hard work, and taking creative risks through theater,” said Cuellar. “Beauty and the Beast” is the biggest scale musical that KIS has produced, complete with dual rotating stages designed by Cuellar and built by KIS stage dads and students, student-made costumes, student-run lighting and sound, and a live pit orchestra. The set pieces and props were designed and built from scratch by stagecraft students and the hand-selected “Beauty and the Beast” crew students, and painted by talented art students. The costume crew, led by the costuming teacher Wendy Moore, worked tirelessly to build and sew costumes including for Belle, played by Sara Kim and Audrey Kim Chung (understudy), the Beast, played by Clement Lee, the wardrobe, played by Suahn Hur, and the clock, played by Daniel Kim. The student orchestra, directed by Nate Bisco, will provide music accompaniment, and music director Jack Brown and choreographer Sydney Langford aided the cast in putting together a performance bound to impress the audience. Rehearsals began in January, and it has been an “arduous process of many long days and nights spent on each and every aspect of showmanship,” says Jared Son, who plays Lumiere, the candlestick. “Working with Ms. Cuellar and Sydney, I got to see over all our rehearsals the way they masterfully conducted the chaos of ‘Beauty and the Beast,’” said Daniel Kim, who plays Cogsworth, the clock and head of the castle servants. While artistry takes time and effort, the students agree that is has become an invaluable part of their lives. “Every time I go onstage, I lose myself and become a new identity,” she said. The theater department has brought together the quirkiest odds and ends of the high school social scene -- in a society that often pressures students to follow conventions, these teenagers are willing to accept each other’s individuality and, more importantly, accept their own fearless and unique identities. It is no surprise that the stage becomes a place of empathy and compassion like no other; rehearsals are full of mutual encouragement and advice. 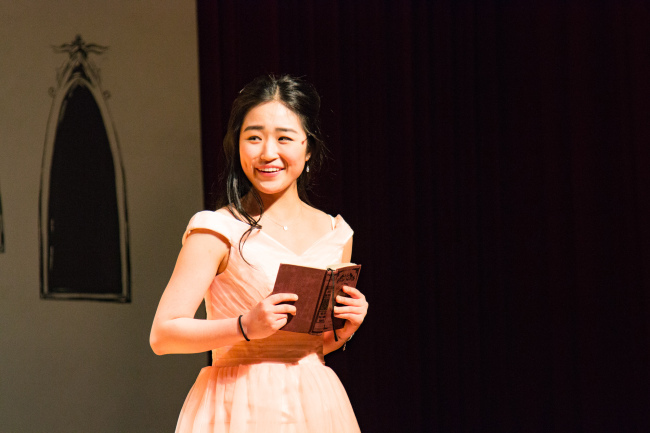 The show will run at 6 p.m. on Thursday and Friday, and 1 p.m. and 7 p.m. on April 21 at the KIS Phoenix Theatre at the school’s Pangyo campus. Admission is 7,000 won for students and others are 10,000 won in advance or 13,000 won at the door. Jisoo Hope Yoon is an 11th grader at KIS. She is performing as Mrs. Potts in this production. – Ed. Korea International School's Disney's Beauty and the Beast is Licensed and Copyrighted by MTI- Music Theatre International. Disney's Beauty and the Beast Music is by Alan Menken, Lyrics by Howard Ashman and Tim Rice, and Book by Linda Woolverton. Originally Directed by Robert Jess Wroth, Originally Produced by Disney Theatrical Productions.